This is war—a battle of sweetness, cane against cob, innocence against iniquity. . . .
Last September, the Corn Refiners Association submitted a request to the Food and Drug Administration. It sought permission to allow the term ‘corn sugar’ to be used in place of ‘high fructose corn syrup’ (HFCS) on products containing the latter. Arguing that there is no chemical difference between table sugar and HFCS, the Association wishes to combat the image problem currently afflicting HFCS and counter claims linking it to obesity, diabetes and other diet-related diseases. On the defense, the cane sugar lobby is bristling at this encroachment onto its territory. Its argument is that ‘corn sugar’ is a misleading to the many consumers who are concerned about the potential health effects of HFCS and wish to avoid it. Only genuine sugar from the cane, genus Saccharum, should have the right it this name, the sugar industry proclaims. So dubious has HFCS become in the public eye that many companies now boast that they never use it and products often claim to be made with ‘real cane sugar’—the natural sweetener, the defender of health and wholesomeness. However, the casting of sugar in a this debate is wildly ironic for is was not long ago that it was portrayed as a thoroughly disreputable character. In those old school health food stores—the sort with endless bulk bins, brown paper packaging, and the determined aroma of barn and pachouli hovering in the air—sugar was satan. The only virtuous way to sweeten your cookies and cake was honey or maple syrup. To have cane sugar now portray the role of wholesome natural sweetener is bewildering. Yet it also reveals a great deal about the way we construct the idea of ‘natural’ food. No food is pure nature. From planting a carrot seed and tending the plant to washing, chopping and perhaps cooking it, a human being—not mother nature—is the active agent modifying and transforming ‘nature’ for consumption. And at a more fundamental level, not even a wild foraged food remains wholly in the realm of nature. The moment you pull a tuber out of the ground, peel a banana, or pluck an apple from its tree, it has left the realm of nature’s wildness and been modifies by the one who pulls or peels or plucks. Many of the foods we buy are labeled ‘real,’ ‘natural,’ or ‘whole,’ but these labels often obscure as much as they reveal. Take whole grain flour, for instance. I always assumed that whole wheat flour was less processed and therefore closer to nature than white flour. Yet this is rarely the case. Today, most flour whether whole or white is produced in a steel roller mill. The wheat berry is passed through a series of rollers that separate the outer layers from the endosperm and then crush this into the flour you find in stores. Because of factory logistics and the relatively high demand for white flour compared to wholewheat, the latter is made by adding bran back into already refined flour. The only exception to this is stone-ground flour which is processed in a simpler way using more primitive technology. And while brown flour is undoubtedly healthier than white, containing more protein, fiber, and micronutrients, but to call is more ‘natural’ or ‘whole’ is stretching reality. The case of sugar reflects a similar manipulation of terms. Whether you buy ‘raw’ sugar with its reassuringly rustic hue or ‘evaporated cane juice,’ all have been extensively refined. 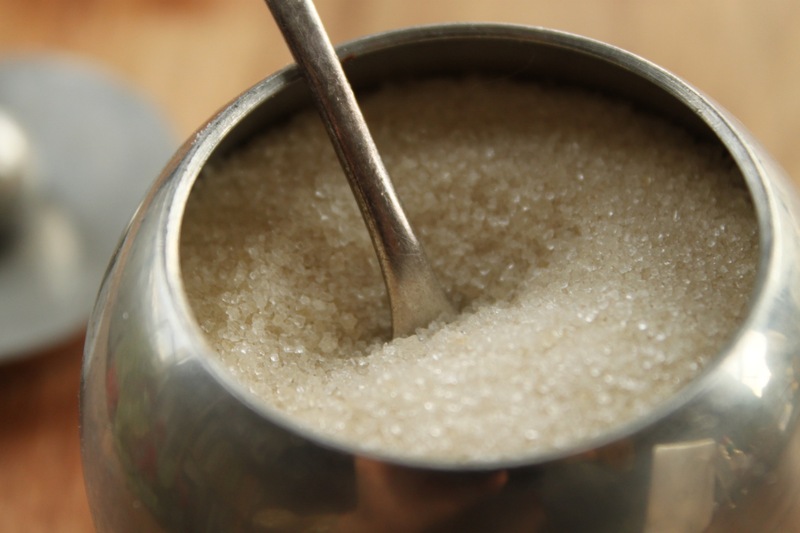 The only truly raw sugar is the syrup that oozes out of a ripe cane, but as this doesn’t keep well or transport easily it is unlikely that you’ll find it outside a sugar plantation. Some scholars argue that sugar was the first food to be industrialized, even before the industrial revolution itself was in full swing. Whatever the case may be, sugar is demonstrably neither natural nor raw. And cook it yourself, I might add.